Description: A combined #203/205 with Ford parts on the head end cross the BN diamonds at Grand Crossing. Description: SOO Line SD40-2 6612 at Bensenville, Illinois on November 17, 1985, Kodachrome by Chuck Zeiler. Description: Now he is backing through the Southeast wye. Description: Here the train is pulling across the diamond toward the south. Description: The train is now on the B&O mainline pointed West. Description: The train stopped just west of the diamond as it prepared to depart for Chicago. Description: Once upon a time, the CP used to run trains through Toledo to Deshler and then West to get to Chicago. The Northwest wye was not in good enough shape to accomodate the move, so the train would have to pull across the diamond and then back up through the Southeast wye. Description: A westbound Sprint train blasts past Mayfair Tower. Description: A westbound Sprint train meets MILW North Line train 2134 Mayfair Tower. Description: Once CP acquired the D&H, they made a big deal of the fact that they now had a through route for grain traffic from the midwest to the Atlantic in the United States, though part of that route was through Canada. They dubbed it the "Niagara Connection" for its border crossing at Niagara Falls. The first "official" train, complete with power from the three component roads, D&H 7309 leading, had a press release and ceremony noting its crossing at Niagara, even though the trains actually started running between Minneapolis and Albany the previous October. We see the first train at Dalton NY, near MP 352. I was travelling from Buffalo with some colleagues from work, so this was the only photo I was able to get. Description: Pair of "candy apples" lead westbound D&H trackage rights train DHT 9 at the "cemetary crossing" on the west side of Cameron. Description: DHT-9, with a train of "bare tables" at Cameron Mills. Description: DHT-9 rolling along through the countryside in West Cameron. Description: CP-BNSF transfer returning to St. Paul Yard. Description: Train 164 rolls into East Binghamton behind the usual assortment of SD 40s, seen from Conklin Av. Description: A different day finds a colorful set of power in golden light as the train crosses the Chemung River. Description: A pair of SD 40-2s, a golden rodent from CP and a candy apple red SOO, are ready to lead this 419 out of the yard and on toward Buffalo. The crew and car department have a few last words as he gets the OK to go. Description: Another 419, led by the typical SD 40-2, rolls west past the remaining semaphore on the Tier. 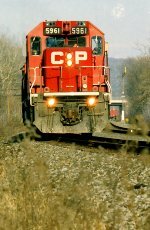 Description: CP train 419 has cleared the yard and is underway toward Buffalo.